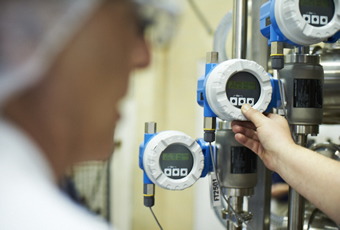 All 11 of our plants have a full-time environmental manager charged with maintaining and improving our Environmental Management System. Our compliance record has improved and is good, and our capacity to measure and standardize our environmental practices is growing. Prior to 2011, we faced several environment-related challenges, but we have responded over these past four years with a thorough environmental management system and approach that has allowed us to solidify reliable performance in meeting our environmental commitments. In addition to having our culture and practice of continuous improvement focused on conservation, we are also committed to significant capital investment for the purpose of reducing our environmental impact. Below we describe just a few examples of the kinds of projects we have undertaken in the last four years that illustrate that commitment. The new glycol cooling system that replaced our ammonia system in our Boise, Idaho, plant. 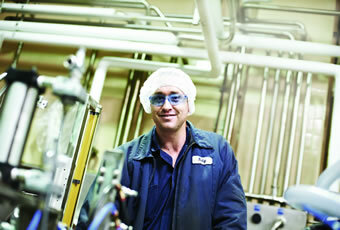 Darigold invested significantly in ammonia upgrades at all of our plants. We installed a new ammonia system in Boise, Idaho, for example, which allowed us to reduce the amount of ammonia stored on site. The new system requires slightly more electricity use, but the 84% reduction in ammonia on site far more than offsets that increase. We undertook this major investment for four primary reasons. First, the volume of ammonia on site, and the scope of the neighboring area that could have been impacted if there was a release, was a serious concern for us. Second, our infrastructure for the ammonia was aging and we wanted to be out ahead of any risk. For example, although no one was hurt, we had a small ammonia release at our Seattle plant in 2012 when an older pipe broke and we did not want anything similar or worse to happen anywhere else. 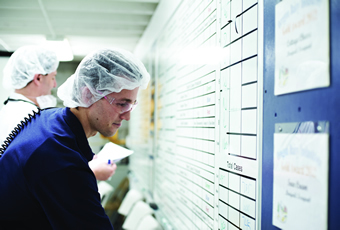 Third, we wanted to improve our ability to cool our milk products; we needed to improve the reliability and effectiveness of our cooling. And finally, the upgrade also allowed us more flexibility with our production, giving us growth opportunities that we wanted in order to be able to address future business needs. Even with an increase in electricity use, the other reasons for the upgrade outweighed that; the overall system integrity and the safety of both employees and surrounding neighborhoods were simply more important factors. Multiple-million dollar investments in wastewater treatment facilities in Spokane, Wash., and Portland, Ore.
Upgraded chemical storage in Chehalis, Wash.
Darigold invested more than $97 million in dramatically increasing the capacity of our Sunnyside plant by 70%, allowing milk to be processed close to where it is produced and thereby significantly decreasing the environmental impact associated with long-haul trucking. About 45-50 fewer truck hauls per day are needed, which adds up to a reduction in transportation of more than seven million miles per year. The expansion was completed in the spring of 2016. In May 2012, a truck driver from a trucking company hired by our chemical supplier delivering cleaning products to the Darigold Portland plant incorrectly connected a hose to the wrong tank. The resulting chemical reaction triggered the release of 166 pounds of chlorine gas over six hours. Twelve people were sent to the hospital, where they were treated for respiratory irritation. Darigold called the Portland fire department minutes after the release, but failed to notify state and federal regulators, as required by law. 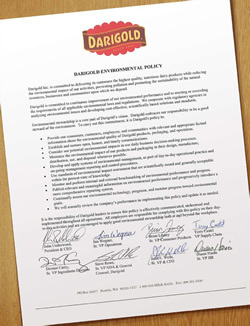 Darigold agreed to a settlement with the EPA to pay a modest fine. Following this incident, Darigold wrote a new program for receiving hazardous materials and trained all employees who receive chemicals at all plants in the proper procedure. These employees are also certified each year in the proper procedure for receiving hazardous materials.